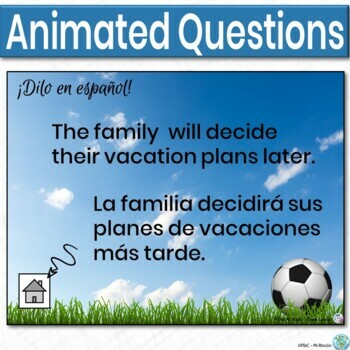 Have fun practicing the future tense verbs with this editable, no prep PowerPoint game. It will give students a wonderful chance to fun while they work to master regular forms of the future. 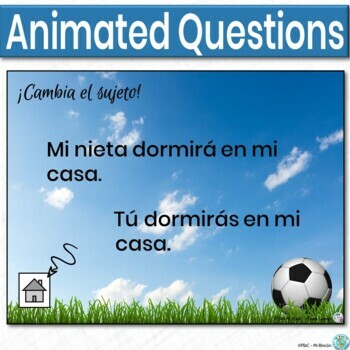 Seeing and using these verb patterns will help students understand the future tense verbs verb forms and be more comfortable consistently using the future tense verbs in all forms of communication. 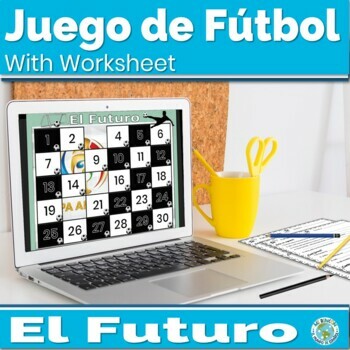 •Regular Future tense verbs Worksheet 1 provides students a place to respond in writing along with class participation. 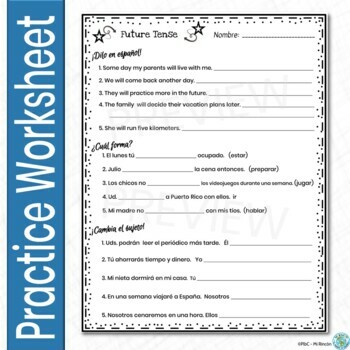 •Regular Future tense verbs Worksheet 2 gives supplemental practice. In order to accommodate differences in curriculum, standards, and classroom needs, this PowerPoint, as well as my other PowerPoints, is editable. While you can edit the text, please be careful when making changes to avoid altering or removing the animation or triggers. I would love to hear how you use these activities in your classroom. Did you know you earn TpT credits for feedback left on paid items? Click to see products you've purchased and haven't yet left feedback! Your feedback is very beneficial to me as it helps me determine which products are most effective in your classroom so I can create more for you. Click here to follow my store, Mi Rincón – El Mundo de Español, and be alerted of updates and specials. Please contact me by email(plbcspanish@gmail.com) with any questions or concerns; I am happy to help! Thanks for your support and interest!